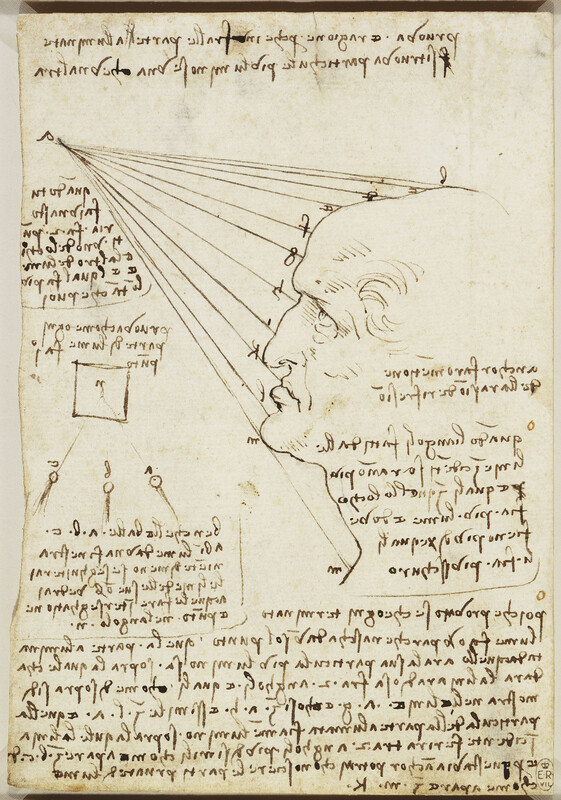 Recto: a drawing of the head of a man, turned in profile to the left, intended to demonstrate how rays of light from a single point would fall upon his face. Also a diagram and many notes on the action of light. Verso: a window in the mount disclosing the number 100 followed by 23 0's in one line and the numbers 100 to 1000 on another line. One of Leonardo’s many unrealised ambitions was to write a treatise on the art of painting. Here he investigates the way light falls at different angles onto a face, in order to capture scientifically the effects of light and shade in paintings. The extensive notes are written in Leonardo’s habitual ‘mirror-writing’.